One of the key components in successful B2B marketing implementation is building social authority. Social media has become a powerful source for new business opportunities and LinkedIn is an ideal platform for creating business interactions and driving traffic to corporate websites. The focus on member's business connection is what LinkedIn differentiates it from other social media networks. LinkedIn operates the world's largest professional network on the Internet with more than 467 million members that represent the largest group of influential, affluent and educated people. If LinkedIn launches an online trading portal, I'm sure it will beat Alibaba.com in no time due to LinkedIn's extensive and intensive connection with the professionals in B2B sectors as well as its business model that emphasizes on content marketing which has been neglected by Alibaba.com where the members are simply publishing machines of simple product information. Standing out in this business-focused environment and building authority in the lighting industry have become an integral part of any B2B marketing plan. LinkedIn provide members with a platform in which to interact with one another by posting new content and/or by posting reactions to content posted by others. Social media marketing is driven by insightful, thought-provoking, or interesting topics, meaning it is user-generated digital content network that allows members to connect and interact with people who share information and opinions of interest to them. LinkedIn offers an incredibly useful platform to develop and strengthen a member's professional identity by posting and sharing professional content including industry news, peer insights, product recommendations, and expert advice. This not only demonstrates that you stay current with the industry, but also enhances your visibility in this professional network. B2B sale cycles are typically long, success in B2B marketing demands a network of interwoven connections through effective content marketing by demonstrating your insights and expertise in a professional context. Export marketing is no longer a game of finding buyers and a salesperson is not merely a middleman to communicate business information. B2B buyers have changed the way they educate themselves and engage with suppliers. Cold calling and email bombing are not as effective as before. B2B buyers are more well-informed than ever and seldom rush into making a purchase decision. They can resort to professional networks such as LinkedIn for peer-to-peer research to evaluate and validate new solutions and offerings in the marketplace. The process of online B2B marketing through social engagement has to begin with the demonstration of seller's expertise and authenticity to create content for prospects to join conversations. The initial conversation should be focused on building ongoing sales relationships by convincing buyers of your genuine intentions, capabilities, knowledge, and expertise in a specific area or industry through presenting valuable, constructive and accurate information, rather than eagerly pushing a particular product or service. B2B buyers often evaluate the potential value of a business relationship by judging supplier's knowledge in a specific field before any direct contact with a salesperson. I made a mistake in thinking that a company page is the place to start for LinkedIn marketing rather than a personal profile. I was misguided by my own superficial impression on LinkedIn as a business network which should certainly be the central repository for B2B marketing on this platform. While the company page is a fantastic place to grow a company's presence and promote its products and services, LinkedIn's success roots in that it provides an effective scheme to facilitate the personal connection and interaction between business professionals. This means the personal profile is the capillary that forms part of the circulatory system and enables the exchange of substances between the blood and surrounding tissues in LinkedIn's life system. For an unknown business, there won't be many followers on its company page. The establishment of social relationship for a business will be tied to the business owner's professional profile and has to start with the personal connection. The LinkedIn profile is not simply a page that describes your career history, education, interests, and other related content. It defines who you are as a professional. A killer LinkedIn profile can help build trust and rapport with your prospects. In the LinkedIn profiles, you have a huge opportunity to emphasize your competitiveness and communicate the value you're able to bring to your prospects. The profile can be built in a way that your skills and experience are prominently presented. But never exaggerate because people are strongly concerned about the authenticity of online profiles. I believe the best marketing is honesty. In my profile I honestly and confidently described myself - I am just me. Although I'm not endowed with a glorious resume, I'm proud of myself in owning the skills and experience that established myself an industry influencer with intensive research in the B2B marketing sector and lighting industry. That being said, the key to a successful LinkedIn profile is to immediately make a positive impression. Although the following profile is an example of dishonest behavior of exploiting gentlemen's intrinsic favor for good-looking ladies, it does demonstrate how important it is to dress an impressive profile. 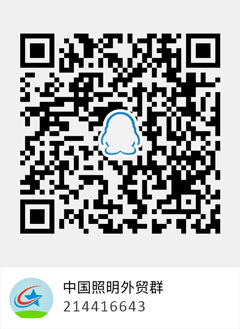 This member's headshot is actually a model's photo seen on a popular smart phone app in China. Her strong presence on LinkedIn are largely attributable to her attractive headshot. If her connections know her photo is fake, will they be willing to keep in connection with a liar? "Dear James, it is such a pleasure to get a chance to connect you. 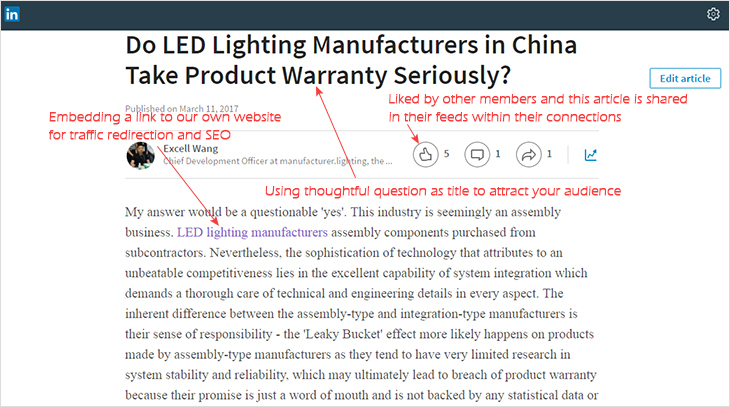 I'm Excell Wang, owner of the B2B lighting industry portal - manufacturer.lighting. I'd love to keep in touch with you to exchange industry insights and explore possible business opportunities in the future." So far it works fine for me. My connections grow from zero to 90+ in three days and are on the increase. My connections are mostly top management professionals in the lighting industry. They're valuable resources that are in align with my strategy to build a strong presence in this professional network to strengthen the brand awareness of our B2B industry portal. LinkedIn Pulse is a very influential publishing platform of great value to marketers who want to share their expertise with the world. It not only gives exposure of your industry insights to your connections and prospects within the LinkedIn network, but also offers a tremendous opportunity to boost the visibility of your company and its content on search engines like Google. LinkedIn is an authoritative web resource and Google assigns much weight to this type of websites in their ranking algorithm, which means your Pulse articles are naturally benefited in search engine rankings. An added bonus is that you can embed external URLs (such as links to your corporate websites) in Pulse articles. This helps redirect targeted traffic to your landing pages on your corporate websites. It also creates link juice that helps consolidate your search engine optimization (SEO) campaigns. The LinkedIn Feed is the sorted list of updates and shares displayed to LinkedIn members. The feed serves to help establish a professional reputation by sharing and creating professional content. LinkedIn members interact heavily with the feed and you can deliver highly targeted content into the feed of your connections. Stand out in the feed by including an interesting or thought-provoking description and a compelling image or some type of rich media. Through the collaborative distribution by the members in your team, your products and services will be spread stunning fast and extensively within the network. LinkedIn Feed is a great portal to do viral marketing by sharing interesting content and unique thoughts. Leverage it to enhance your professional brand and increase your connections' engagement with your brand. I can personally attest that the LinkedIn Company Page is an overemphasized but feature-lacking product for one single reason - it cannot connect. For new brands it's a page that relies heavily on personal connection because no audience exists for an unknown company. The Company Page does not have the feature to invite members to follow it and accordingly no active marketing can be performed. In addition the LinkedIn hashtag function is not as powerful as Facebook or Twitter, meaning its self-promotion feature is lame. But the Company Page still should be robustly built and vibrantly promoted because it's the place where you can catch the eye of prospective customers. Take advantage of your personal connections to increase engagement on your company page. Promote the company page off the LinkedIn network (e.g. emails, brochures, websites). Last but not least, social media marketing is about engagement and interaction. LinkedIn provides many opportunities to engage with prospects. 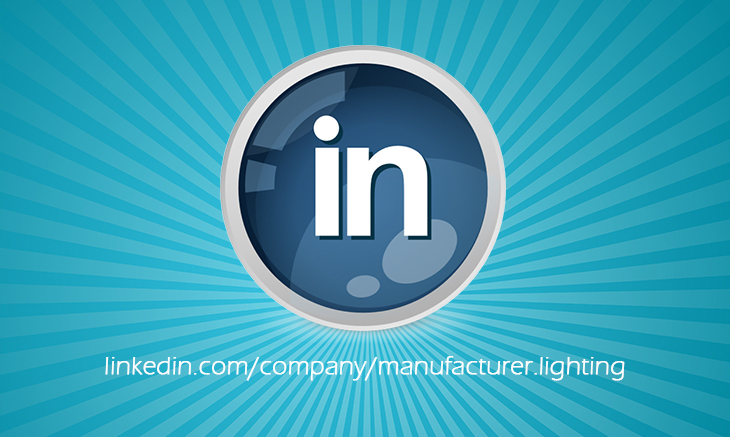 LinkedIn Groups, for example, are great places to engage with targeted audiences responsive in your industry. You can also foster familiarity and build trust with your new connections by regularly engaging with their LinkedIn feeds. Like, share and comment on their updates. You'll create a favorable impression in their minds and ultimately establish a superior level of trustworthiness to the communication. This is the magic of social interaction. The key is to put in the time to participate and invest your knowledge in cultivating conversations, connections, and relationships.